Description This advanced training will be focusing on building a routed network using Mikrotik equipment. With routing, you could make your network to be scalable, manageable, and secure, eliminating unnecessary NAT on internal network. Topics that will be covered in this are static routing, OSPF, load balancing, VPN, and VLAN. 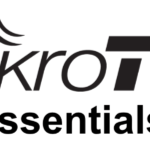 Recommended for This course is aimed at people who already use Mikrotik RouterOS and wants to implement/manage a routed network.